World No. 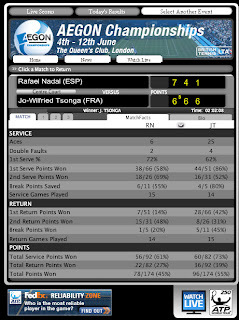 1 Rafael Nadal lost today to Jo-Wilfried Tsonga a 6-7(3), 6-4, 6-1 in the quarter-finals of the AEGON Championships on Friday evening at The Queen’s Club. World No. 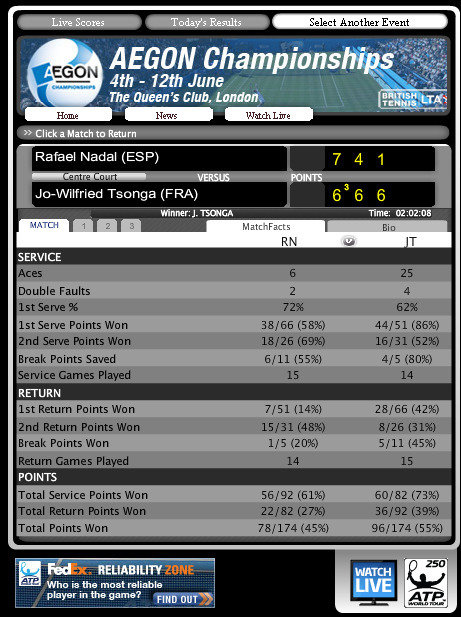 1 Nadal arrived in London on Monday evening straight from winning his 10th Roland Garros crown on Sunday (d. Federer). The Mallorcan was bidding to regain the title he won at The Queen’s Club in 2008. Rafa has also pulled out of doubles! Vamos see you in Wimbledon & rest well Campeon!